Turkish Prime Minister Recep Tayyip Erdogan attacks Israel, says it conducts a "slow but methodical massacre" in Gaza. Turkish Prime Minister Recep Tayyip Erdogan took advantage on Tuesday of the escalation in southern Israel to once again attack Israel, as he has done on a regular basis in recent months. Speaking at the headquarters of his Justice and Development Party, Erdogan accused Israel of committing a “massacre” in Gaza and called Israel’s citizens to speak out against the government. Erdogan said Turkey will continue to stand firmly against the “injustice” and alongside the people of Gaza. He left out the fact that terrorists in Gaza have been constantly attacking Israel with rockets. More than 200 rockets were fired at southern Israel in four days of hostilities. Despite a ceasefire which began Monday night, terrorists continued to fire rockets and missiles into Israel throughout the day. Turkey and Israel’s relationship deteriorated when Turkey demanded that Israel apologize for the deaths of nine Turkish nationals onboard the Mavi Marmara in May of 2010. The Turkish citizens were killed when Israeli soldiers who boarded the Gaza-bound ship were forced to open fire after being attacked by the activists on board with clubs and knives. Prime Minister Binyamin Netanyahu refused to apologize for the incident, and Turkey responded by downgrading its diplomatic ties with Israel. 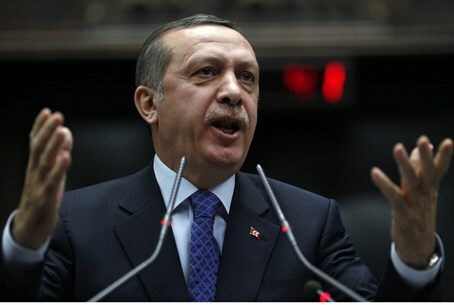 Erdogan further deteriorated the tense situation when he chose to verbally attack Israel on several occasions.